Below is a list of those available by and about Aleister Crowley. Contact Facebook user Martti Hill for more information. Germ Books just uploaded a collection of Crowley books for sale, including 777, Konx Om Pax, I Ching, The Vision & The Voice, Vol 2 of Collected Works, and more at great prices. About the bookseller: GERM Books + Gallery began out of a need for a truly alternative independent bookstore that would provide access to ideologically unpopular books; books that address difficult social topics; books that don’t cater to the lockstep mentality of the current counterculture; and books that reveal who our true masters are: The UFO Overlords. GERM also has a fine selection of classic and contemporary literature, esoteric writings, conspiracy theories, UFO books, science fiction (specializing in Alt-History, Post-Apocalypse and Cyberpunk), psychology, poetry, preparedness, hippie lit, hipster lit, and the obligatory fringe bookstore titles. The Vision and the Voice starts at about $50. 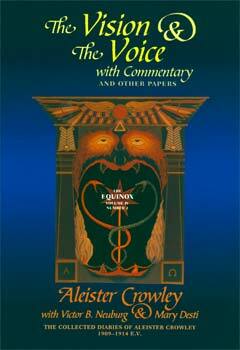 The Vision and the Voice (Liber 418) chronicles the mystical journey of Aleister Crowley (1875-1947) as he explored the 30 Enochian ?thyrs originally developed by Dr. John Dee and Edward Kelley in the 16th century. These visions took place at two times: in 1900 during his stay in Mexico, and later in 1909 in Algeria (along with his magical companion, Victor Neuburg). Of all his works, Crowley considered this book to be second in importance behind The Book of the Law, the text that established his religious and philosophical system of Thelema in 1904. The Vision and the Voice is the source of many of the central spiritual doctrines of Thelema, especially in the visions of Babalon and her consort Chaos (the “All-Father”), as well as an account of how an individual ego might cross the Abyss, thereby assuming the title of “Master of the Temple” and taking a place in the City of the Pyramids under the Night of Pan.